The music industry often slips into the habit of describing artists as "exciting newcomers" or some such when in fact they've spent years of dues paying getting to their current state of popularity. Such is the case of New Jersey-based gospel singer, songwriter, choir director and multi-instrumentalist Tye Tribbett who with his group G A (that stands for Greater Anointing) has enjoyed success with his albums 'Life' (2004) and 'Victory: Live' (2006). Tribbett is truly a child of the Church. His mother was choir director of El Bethel Church of Christ in Camden, New Jersey, and his dad was the pastor. Being something of a keyboard protégé, Tye knew notes on the piano before learning the alphabet. During his teenage years, Tye played for various community choirs like Steve Middleton And The Tri-State Mass Choir (an offshoot of the Edwin Hawkins Music & Arts Seminar). In 1996 he gathered a group of friends and siblings and began doing concerts as Tyrone Tribbett And Greater Anointing. Tribbett said he began developing his songwriting out of necessity. "Back then my choir wasn't that good. I said, 'Let me just write this simple song that you all can get [easily].' So I wrote it and the anointing was all over it. People began to call and ask for songs. I said, 'I'm not a writer, I just did that for my little choir.' [But] then I began writing, writing and writing." He and the group recorded an independent album. But the ensemble got their big break in the most unlikely of ways when they were asked to back country superstar Faith Hill on her tour in 2000, resulting in a flurry of appearances and recording work with everyone from Will Smith, Usher and Mary Mary to Don Henley, Justin Timberlake and Sting. Eventually the function of bringing a little gospel flavour to big budget recordings of pop superstars began to pall slightly but in 1998 Tye Tribbett & G A recorded a track for themselves, "Let Go, Let God" appearing on the soundtrack album accompanying the animated feature film Prince Of Egypt. Not surprisingly, considering his group's involvement as pop and rock backing singers, Tye claimed stylistic eclecticism when G A were signed to Columbia and recorded the live album 'Life'. He told Billboard, "My musical influences are so wide. [There's] a little country, a little pop, some rock'n'roll, some gospel. As long as the spirit is within us, there are no boundaries at all. That's why it's just 'music undefined.' . . . I just wrote words out of my heart, like most writers do. But as I listened [to] all the songs, [I realised] they dealt with everyday life. The message that I hear on here is hope. All these songs talk about real life. And whether it's pressures or temptations or just anxiety or jealousy or envy, it touches on all those things, but at the end there's always hope." In 2006 Tye Tribbett & G A released their 'Victory: Live' album. It became a mainstay in US gospel charts, winning two Stellar Awards and gaining the group their first Grammy nomination. In addition, Tribbett undertook international tours and guest spots on albums by Kirk Franklin, Men Of Standard and Da'T.R.U.T.H.. Tribbett spoke about 'Victory', describing it as "an all out attack against the enemy with praise and worship." He said, I'm stepping to the enemy. Some church folk are scared to fight these things. But I feel like we come in the spirit of David - This young boy who knew how to praise and worship. The Bible says David ran to meet the Philistine! He ran to Goliath! We're saying, 'Devil, we're not scared of you!' It's a very, very bold, BOLD song. And I love that!" One of the most popular songs on 'Victory' is "Sinking". Explained Tye, "This is an old school song. When I think of the goodness of Jesus and all he has done for me, that's how it starts. It reminds me of when G A first started and people were kind of looking at us like we were buck wild. Like, 'Don't have this group around your church!' This is a song, 'When I think of the goodness of Jesus,' that I can perform at those churches. Early on I thought I was setting them up though. But God was setting me up, because it means so much to me now." 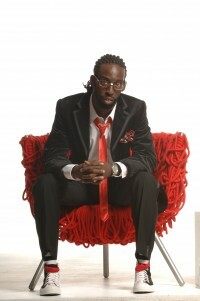 In August 2007 Tye Tribbett & G A went to Virginia Beach to film the CD/DVD 'StandOUT' which is set for UK release in May. The two-day recording at The Rock Church International showed just what a thrilling visual spectacle G A had become. Dressed in white tops and black skirts, the female members of the group began a dance routine fused with the bold message of the album's title cut. G A's men crawled in carefully, joining the fray. Donned in retro black suits with thin black neckties, G A formed an army ready for war, encouraging everyone to "StandOUT". Suddenly, G A dropped to the floor with Tribbett standing in the middle and the praise party was off and running! With a welter of special guests such as Judith Christy McAllister, Kierra 'Kiki' Sheard and Kim Burrell, the project is guaranteed to be a huge hit when released. Today, Tye is working as hard as ever. Married and with a five year old daughter, the multi-faceted musician spoke to Gospelflava recently about his reaction to his unexpected rise to gospel music stardom. "I honestly thought I missed my season when Kirk came out. I didn't start after Kirk. We were both already rocking and doing our thing. My point is when he hit the scene I was like 'whoa'! He's kind of doing what I thought we would do, so that position is fulfilled. We don't have to do that. I thought I missed it. I was content at that point with singing at church and being faithful to the Sunday morning duty. I thought I missed my season and I never thought it would be like this. You're told that with every goal, you know, you write down your visions and make it plain. Every vision and goal I had for G A and the ministry has been met and surpassed. What [God] is doing with this ministry is unbelievable. I know he's only giving me the platform to give him glory. I'm not stupid. I'm not soaking it all in. Nah, I'm trying to point it to him in every aspect." Hmmm. This interview was done in 08, when Tye/Shante had @ daughters. So y does he only mention 1? tyrone i love u! from day 1...... u and GA always put it down. but i would like to kno y does the males get all the attention and not the girls! wats up wit dat!.......anyways i support u and GA n all yall do! keep doin it big all fo the glory of god! be blessed. PS THANKZ FO SPENTING TIME N VA! i love tye and ga my sister bought the cd and the dvd and it is great. i love the message and brings to young people like myself. all i have to say is kirk franklin and got nothing on them!!!!!!!!!!!!!!!!!!!!!!!!!!!! Yeah...i been watching some vids for Tye and GA on Youtube. They are awesome....not for the faint hearted or the traditionalists I'd say. But very refreshing and entertaining and also God-pleasing too. Looking forward to seeing this new DVD.